There can never be too many cats! Turn your Firefox into Firecat and enjoy browsing in the furry company. The Red Cats theme comes in green and blue flavor. There will be NO other flavors of Red Cats nor will there be a dog version of the theme. Latest development build: none at the moment. 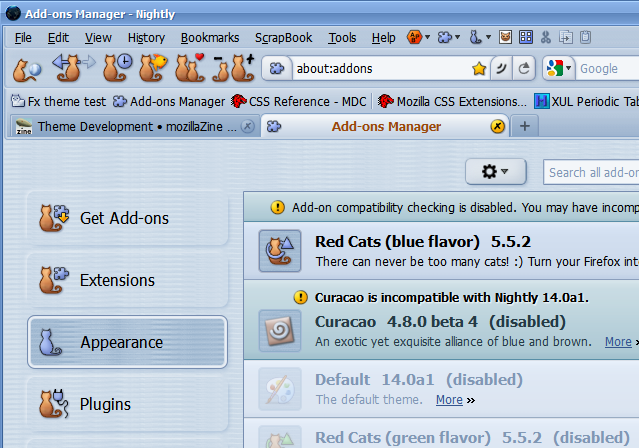 Spice up your Cats with a few hacks - just add the respective code to your userChrome.css and restart Firefox. Note that the code should go BEFORE any other text you may find inside userChrome.css or it won't do the trick. Alternatively, use Stylish - install the extension, click on the icon -> Write New Style -> Blank Style -> copy and paste the code. Deprecated! 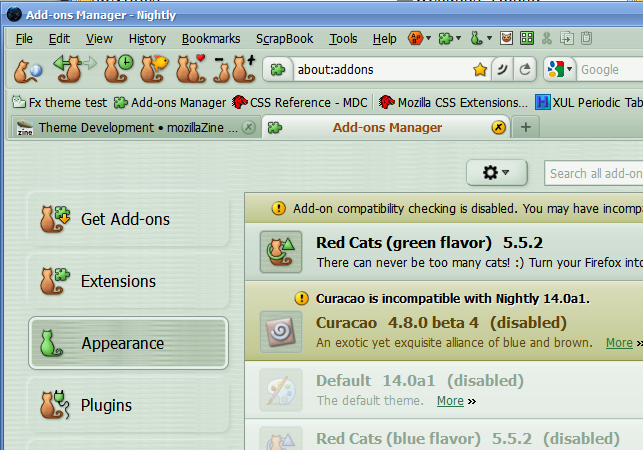 Only for Red Cats 5.7.0. Do not use any of these if you're running Red Cats 4.8.0 and up. Last edited by Red_Fat_Lazy_Cat on June 18th, 2016, 9:56 am, edited 37 times in total. Welcome back! You are a brave soul! Me, I'm waiting for the Calico/Tiger version. Santa_Fe wrote: Me, I'm waiting for the Calico/Tiger version. Many thanks for bringing the cats back. I have a slight "glitch" though. I used the .css code for replacing the Back/Fwd buttons = O.K., but the Fwd button only shows the "Arrow" & text & my little cat is missing, as well as the Drop down arrow, as shown in your image. She's in the Back button, just not wanting to show up in the Fwd button. 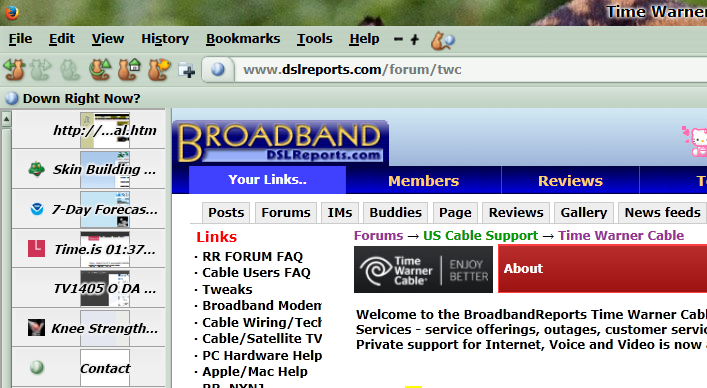 I also used the Buttons on bottom from CTR .css which is fine. Oh. Apparently, I forgot that there exists the small icons + text mode so no wonder the theme doesn't support it properly. Will try to fix the glitch but I have two busy weeks coming up so you'll have to wait. Once again, many thanks for putting so much time & effort into maintaining the theme. It's nice to have the cats back adorning my screen. Wow! I have used this theme on my XP computer forever I think. It's really nice to see it updated. It has always been my favorite full theme. I've been using personas on my Windows 8.0 Pro computer with Fx 24.5 ESR, but after reading this thread, I installed Red Cats. It makes my Multicolumn Bookmarks extension look much nicer as the columns with this theme are more narrow, neater looking and not sprawled out like with personas. Red Cats new tab icon is missing on my Windows 8 computer! How do I get it? It's not in Customize. I have it on my XP computer with an old Fx4 that I use there. I vaguely recall something unusual way back many years ago with the Red Cats new tab icon but I can't recall if I had to do something special to get it or what. Also, is it possible to somehow color my vertical tab bar? I hate the pale gray default background color. I use Tree Style Tabs extension on both computers. On the XP Pro computer, the background for the vertical tabs is pale green but it stays pale gray on Windows 8. If I make the tabs horizontal across the top on Windows 8 then they are pale green but I hate tabs horizontal. Check the Tree Style Tabs options, there should be an option to allow the tabs to follow colors from the theme (as well as other hard-wired options). Thank you! I don't recall seeing that before. I haven't looked at Options in some time though - glanced whenever there was an update to the extension but didn't look closely. The option was there under "Appearance" in Tree Style Tabs. Looks great now! I love green color and the red kitties are adorable. I wish I could just grab the Red Cats New Tab button off my XP computer and drop it on this Windows 8 computer. The New Tab icon that is there currently does NOT go well with all the Red Cats! Thank you!!!!!! I'M SO HAPPY TO HAVE MY KITTIES BACK!! Please don't regret being brave remember that in every hero lives the coward & in the coward resides the hero, what they are is the one they choose to be. Now most important I'm using the 5.7.0 beta of Red Cats green flavor in Australis and so far all looks and operates as it should. I have also tried using this with the Classic Theme Restorer addon and I'm happy to report that it works purrfectly there as well. I'm using Fx 29 in Opensuse 13.1 with the KDE UI. THANK YOU for keeping the kitties updated! Browsing is just not the same without them. Question: Somehow I lost the BACK and FORWARD kitty icons; I think this happened when I clicked on "Restore Defaults" which I did for a reason I can't remember now. Have tried to restore them with the hack @import url(chrome://global/skin/hacks/oldBackForward.css); , but no joy. I still have the plain old black left and right arrows. I also don't have a STOP kitty icon, and I remember that there was one of those. Have tried uninstalling the beta version 5.6.3 + dev build, deleting the localstore.rdf file, and reinstalling the beta version. Still no joy. What can I try next? TIA.